You can control how the products are sorted in your catalog. You can also set the number of products listed per page. Log in to your WordPress admin and navigate the the Cart66 Cloud settings panel. There you will see the Product Options section of the settings. You can choose to sort the products by price or by the name of the product. You will also see an option to set how many products show up on a "page" of your catalog. Rather than sorting by price or product name, you may want to sort your products by menu order. This is the order of the pages as you see them in your WordPress admin. An excellent plugin to use that will allow you to drag-and-drop the product pages into the order you'd like is Intuitive Custom Post Order. You can also use this plugin to control the sort order of your product categories. 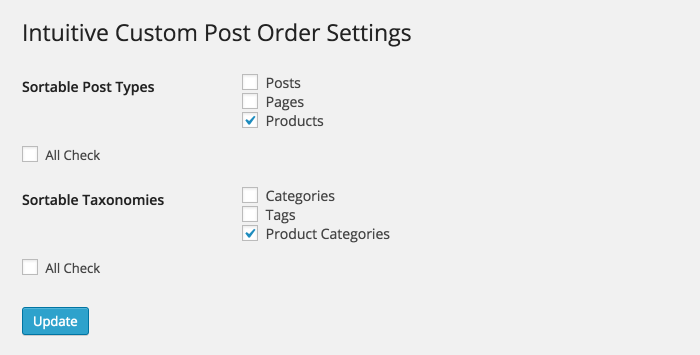 After you install and activate the Intuitive Custom Post Order plugin, you will want to go to the settings page for that plugin and select the post types and taxonomies you'd like to be able to sort. You can select as many as you'd like, but at a minimum, select the Products post type and the Product Categories taxonomy. Once you have set the options above, navigate to your Cart66 Products tab and you will see that as you hover over your products you can click on the rows in the products table to drag-and-drop the products into any order of your choosing. Remember if you have your Cart66 Product Option settings set to sort by price or name, then rearranging your products will not have any effect on the display. Be sure to set the Sort Products By option to menu order.